The Harriers signed the West Brom midfielder, Rob Davies, on loan today for an initial one month loan spell. 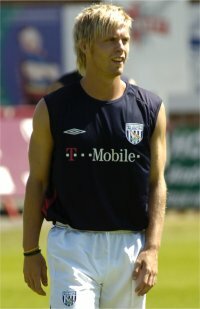 The 21yr old joined the Baggies from Wrexham in June 2003 after a tribunal set a fee of �50,000 rising to �250,000 on appearances. He has made just the one game for the Albion first team when he played in a FA Cup defeat at Reading last season. The Welsh born youngster has also made two under 21 appearances for his country, against Nth Ireland and Cyprus. During his time playing for the Albion reserves, including playing at Aggborough, he has scored a total of eight goals. He has signed for the Harriers just in time to be thrown in at the deep end at Exeter tomorrow.